When people travel, all too often they only experience the parts of a destination that are made for tourists. Guidebook safely in hand a travel insurance policy safely in bag, tourists from all over the world visit Sydney each year. The majority of those people see very little of the real Sydney, choosing instead to spend their time climbing the Harbour Bridge or taking in high tea at the Opera House. Of course these are worthy tourist destinations and definitely should not be missed, but if you’re looking for a slightly more authentic Sydney experience, this is the article for you! One of the best ways to experience a city is through your taste buds, and Sydney is no exception. With one of the most dynamic and exciting culinary scenes in the world, Sydney will constantly amaze you with the gastronomic wonders it has on offer. No matter what your budget, you can find quality food in Sydney. If you’re looking for cheap eats, head to Chinatown in the city centre, and sample the most authentic of Asian cuisines for a very nifty price. Instead of dining right on the harbour in restaurants that pushes up their prices and dumb down their menus, check out a few local food blogs to figure out where to go to eat. If you want to feel what it’s like for the true urban Sydneysider, head to Crown Street in Surry Hills for a range of great options, or King Street in Newtown, an alternative hub that is positively lined with quality food outlets. If you’re looking to spoil yourselves, Tetsuya’s is a Sydney institution, and while it’s fairly pricey, you’ll be blown away by the skill and quality of the dishes. 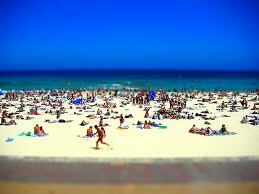 Of course, everyone heads to iconic Bondi Beach as soon as they set down in Sydney, and so they should. The beach is an Australian landmark and a very beautiful one at that, but there is so much more to see in terms of beaches than just Bondi. Don’t make the mistake of spending all of your time on Bondi Beach, instead explore some of the lesser-known harbour beaches that provide brilliant views of the city. Places like Camp Cove in Watson’s Bay and Milk Beach in Hermitage Bay National Park are both prime examples of dazzlingly beautiful beaches that remain un-crowded even on the hottest of summer days! Another great way to experience the real Sydney is to check out the local events and festivals guides. There are generally markets on every weekend all over the city, and here you’ll get a great taste of the way Sydneysiders like to spend their days off. Alternatively, check out whether or not there are any outdoor music festivals, concerts or other interesting events and head along to take part. Sydney hostels are full of eager travellers who cannot wait to experience the real Sydney. It’s easy to become sidetracked by all the touristy things, but if you hunt around a bit you’ll find that everyday life in the Harbour City can be just as exciting.